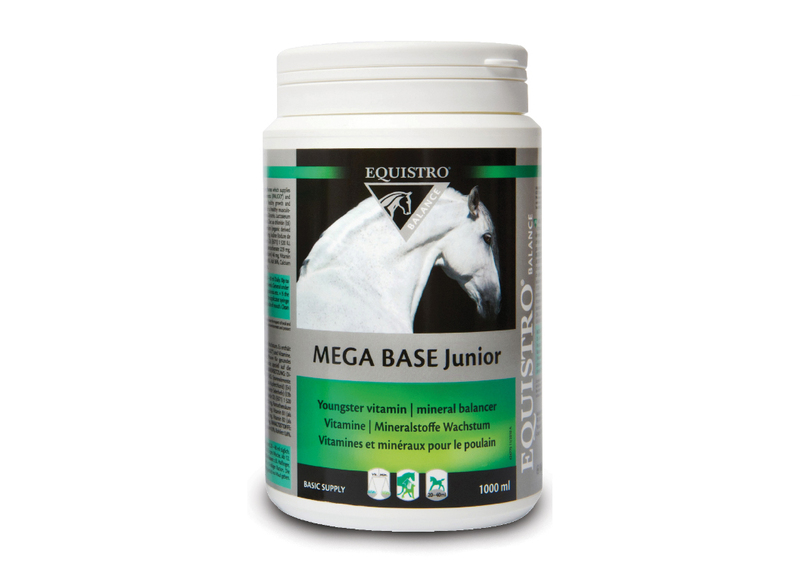 Mega Base Junior is a complementary feeding stuff for suckling foals and young horses which supplies valuable minerals (calcium, phosphorus and magnesium), trace elements and vitamins to meet the requirements pre and post weaning, a critical period for healthy growth and development. Mega Base Junior is specially formulated to supply essential nutrients required for healthy muscle, bone and joint development. Megabase junior is a complementary feed. It is available in: 1 L (Days of supply: 25 to 50 days). COMPOSITION: Dicalcium phosphate, Glycerin, Delactosed whey powder, Magnesium chloride. ADDITIVES/KG: Compounds of trace elements: Zinc as chloride, monohydrate (E6) 570 mg, Manganese as chloride, tetrahydrate (E5) 275 mg, Copper as cupric chloride, dihydrate (E4) 210 mg, Selenium (Organic form produced from Saccharomyces cerevisae CNCM I-3060 – selenium inactivated yeast) (3b8.10) 19 mg, Iodine as potassium iodide (E2) 2 mg. Vitamins and pro-vitamins: Vitamin A (E672) 10,000 IU, Vitamin D3 (E671) 1,520 IU, Vitamin E/all-rac-alpha-tocopheryl acetate (3a700) 760 IU, Niacinamide (3a315) 460 mg, Folic acid (3a316) 305 mg, Ca-D-pantothenate (3a841) 229 mg, Vitamin K3 76 mg, Vitamin B1 (thiamine hydrochloride) 69 mg, Vitamin B6 (pyridoxine hydrochloride) (3a831) 50 mg, Vitamin B2 (Riboflavin) 46 mg, Vitamin B12 11 mg, (cyanocobalamin) β-Carotene (E 160a) 4 mg. Aromatic substances: Glycine 2,600 mg. ANALYTICAL CONSTITUENTS: Water 48%, Crude ash 37%, Calcium 11.5%, Phosphorus 7%, Crude protein 1.1%, Magnesium 0.9%, Crude fat 0.8%, Crude fibre 0.3%, Sodium 0.23%. • Broodmares (500kg): Prior to foaling 20 to 40 ml per day. • Foals, up to weaning: From 4 weeks old 20 ml twice weekly. From 8 weeks old 20 ml 3 times per week. General underdevelopment from 12 weeks old 20 to 40 ml per day. • Middle-sized breeds: ½ of the above ration. • Small breeds: ¼ of the above ration. Fill the applicator syringe with the desired quantity of the preparation and carefully administer to the foal through the side of the mouth. Clean and dry the syringe thoroughly after each application. N.B. Due to the presence of trace elements and vitamins with maximum set limits, administration must not exceed 40 ml/ 100 kg horse/ day.